The American Hemerocallis Society (AHS) is active throughout the United States and parts of Canada. To help you locate a daylily group near you, the AHS has divided the country into regions. For information about regional AHS activities, select the region or state of your choice. Click on the maps or the colored bars beneath to link to the Region. The AHS also has members in the countries filled with the different colors in the map below. Australia, Belgium, Brazil, France, Germany, Guatemala, Hungary, Italy, Japan, Latvia, New Zealand, Pakistan, Peoples Republic of China, Poland, Republic of Belarus, Republic of South Africa, Russia, Slovenia,	Spain,	Sweden,	Switzerland,	The Netherlands,	Ukraine, United Kingdom	and Zimbabwe. 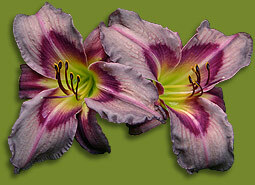 © Copyright 1995-2012 by the American Hemerocallis Society, Inc.